We are all well-acquainted with the powers and benefits of gin; to recount them here, even during The Ginaissance, would be superfluous. Instead we cordially invite you to take a walk down memory lane with us as we look at some of the highlights in the history of gin and its soulmate the taco. Did you know that gin was responsible for Richard Nixon's Presidency? I bet you didn't. But it was. The hotly-contested 1968 Democratic primaries culminated in a showdown in California between the brother of recently assassinated President John F. Kennedy and peace candidate Eugene McCarthy. Due to the growing unpopularity of the Vietnam War, the incumbent Lyndon Johnson (possibly the biggest prick in the history of politics, but that's another issue) declined to seek another term. As the McGovern-Fraser reforms had not yet been instituted, primaries were still irrelevant to the nominating process. That is, the primaries were popularity contests and nothing more. No actual delegates were assigned based on primary results. So the Democratic front-runner, Robert F. Kennedy, didn't simply have to fend off the challenge of McCarthy and his army of "Clean for Gene" college volunteers – he also had to win the primaries convincingly enough to impress the delegates to the Democratic Convention, the majority of whom were predisposed to support incumbent VP Hubert Humphrey. Winning California would do just that. In one of the first primary elections that became a full-scale political war, Kennedy edged McCarthy by just a few percent when all the ballots were counted. Clean Gene and his army (think Howard Dean before Howard Dean) were resigned to defeat and comfortable with the fact that, if not McCarthy, at least it wouldn't be Humphrey. And it sure as hell wouldn't be Nixon. A slightly fanatical Palestinian immigrant to the U.S. named Sirhan Sirhan had his heart set on killing Robert Kennedy because of his pro-Israel policies. The Sirhan family had fled their home in Israel after the Balfour agreement carved out the Jewish state after World War II. So Sirhan had a bit of a grudge. The problem is, he was also a brooding coward. He tried to kill Kennedy on several occasions but lost his nerve. He planned once again to commit the crime on the night of the California primary. He arrived at the Ambassador Hotel to take RFK out before the election results were in, but he once again chickened out. Instead of abandoning his plan, he retreated to the hotel bar and, in an act that changed history, downed four Tom Collins in an hour. Now, as men who have frequently downed four Tom Collins in an hour, ginandtacos.com can assure its readers that this is a sufficient amount of gin to prompt an assassination. And it did just that. Sirhan's liquid courage, combined with the Kennedy team's use of celebrity bodyguards that evening (I wish I was making that up), sealed Kennedy's fate. 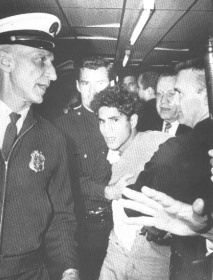 Sirhan emptied a pistol into him, scoring one shot to the head, and he died early the next morning. The rest is history. The Democratic party tore itself apart at the Chicago convention, with a sizeable assist from Richie Daley, and nominated the virtually unelectable Hubert Horatio Humphrey. The ironic thing is that the nation was so virulently Democratic at the time that Triple-H almost beat Nixon anyhow. But he didn't, and the nation got Nixon, wage/price controls, 8 more years of Vietnam, and Watergate. Without those four Tom Collins, Sirhan probably would have went home, struck a bunch of tough-guy poses in the mirror, and cried himself to sleep. The nation would have had eight years of RFK and potentially different outcomes in Vietnam. But hey, that's all hypothetical. Good job, gin! Postscript: Sirhan Sirhan was convicted and sentenced to death, a sentence that was commuted in 1972 when California abolished the death penalty. He still resides in California State Prison at Corcoran, and as of 2004 he has been denied parole 13 consecutive times. Ginandtacos.com: Heading face first into the Ginaissance. The Ginaissance Presents: Sir Robert Burnett, Fact or Fiction? I like the distinction, by the way, between "biggest prick" and "WORST prick"–that way, we can agree that Johnson was a colossal prick, but someone like, say, Roy Cohn was a WORSE prick. But this is supposed to be about gin. Any noted presidential figures known for their consumption of the nectar of the gods? I would also like to point out that, conversely, without gin, we would not have been able to trade freely with Communist China since, as history seems to acknowledge, only NIXON could go to China. But he didn't, and the nation got Nixon, wage/price controls, 8 more years of Vietnam, and Watergate.